Corded or Cordless - the choice is yours. 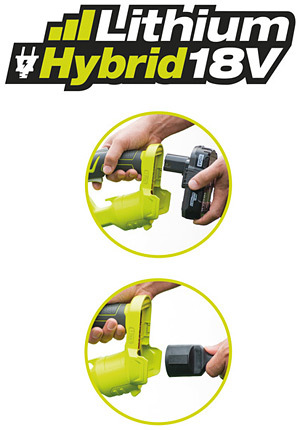 Ryobi's innovative 18V Hybrid power design, offers the choice of seamlessly changing between corded and cordless power in the same tool. Connect to standard 240VAC mains power (UK socket only) using the power cable provided or if the cable is out of range of a power socket, switch off the power remove the power cable and connect a Ryobi ONE+ battery. Then your good to go anywhere in the garden without the constraints of the power cable. As part of the ONE+ System, the 18V Lithium+ battery is compatible with all of the home & garden tools in the ONE+ cordless system. The ultimate flexible powered tool.